Every university is different, and every college student is different. But if there is one experience common to all students, it's the constant shortage of money during their time in college. Care packages from home only go so far, and it will seem like every time you check your bank account the balance just gets smaller and smaller. But there are ways to manage your money while in school, and to make the most of what little cash you have. Life on campus offers a lot of temptations for the unwary student. There are many ways to blow through your spending money without realizing how fast it's going. But there are plenty of ways to save money while on campus without denying yourself any of the fun and adventure that college life has to offer. Necessities will take up a large portion of your college fund. Tuition and books, furniture and clothing, class fees and lab fees all add up fast, leaving you with a small amount of money to spend on food and entertainment. There are ways to save money on all of your college expenses, and with a few handy tips to consider you can make your college funds stretch farther than you may think. Meals are one of the biggest offenders when it comes to putting a dent in your college finances. Certainly your have to eat, but with a little discipline your food budget can prove to be one of the best places to save money. Consider the following tips to help you better manage your food expenses while on campus. Make a weekly food budget and stick to it. If you have paid for the campus meal plan—use it. Cut out any unnecessary restaurant spending. Eating out can seriously compromise your food budget. Avoid alcoholic drinks in restaurants and bars. The cost of going out is prohibitive for college students. A night on the town will seriously impact your food budget. Eliminate daily specialty coffee drinks, smoothies and other treats. The cost of these treats is deceptive, and a regular habit will add up fast taking a large chunk out of your allotted food money. Pick up a cheap coffee maker or a blender, and make your own specialty drinks in your dorm room. Food is a necessity, but with a little planning and budgeting you can save a great deal of money. Be as strict with your food spending as you are with your studying, and you'll avoid having to write home for emergency funds. 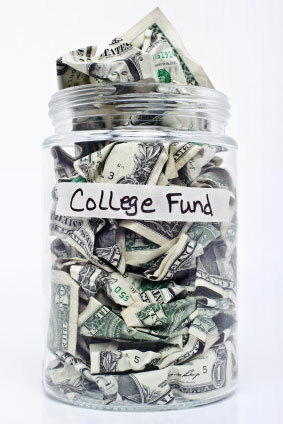 Set up a 529 college savings plan while in high school to make the most of the money you save. Sell your textbooks when you are finished with them. The campus bookstore will buy back used books, or you might try selling them on line. Either way you can recoup some of your money by passing your textbooks on. Credit cards, used judiciously, are a real necessity for college students. They provide a little safety net for those months when money is extremely tight, and can help a student build up a good credit history. But in careless hands a credit card can be ruinous. Follow these tips to help you better manage your credit card use, and to avoid any sudden debt. Use credit cards only in an emergency. Don't buy anything on credit that you do not absolutely need. Remember, want does not equal need. Pay the balance each month. Keep a low credit limit. Avoid impulse buys at all costs. It is certainly possible to save money while you are in college. Consider your monthly expenses, and look for small ways to cut back. Every little bit adds up. If it helps, save your receipts for a month, and analyze your expenses. You're bound to find ways to cut corners, and stretch your college budget without having to endure too many hardships. Remember, every other student on campus is doing the exact same thing, trying to save money wherever possible.